Cold Steel Corporation has established a remarkable position in the warehousing construction industry. Having built over 7 million sq. 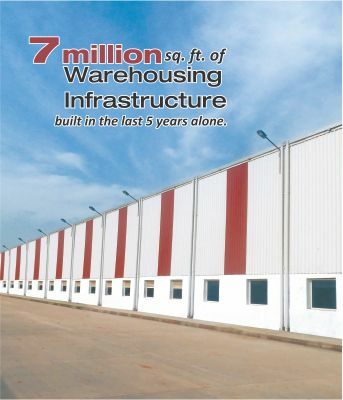 feet of warehouses, for leading Indian and International clients, in the last five years alone, it has achieved a feat like no other. Warehouse buildings built by Cold Steel are most widely accepted by all multinational clients and are at par with any international standards. These warehouses cater to FMCG, food grains, automobiles, white goods, consumer durables and large retail outlets. Today’s warehousing needs generally require large open spaces for the flexibility to store a wide range of goods in different layouts safely and economically. Cold Steel offers the best options for both vertical and horizontal storage. Designed to achieve maximum economy Cold Steel provides premium quality warehouses (Pan India) that serve all kinds of requirements. Optimum Green Building solutions in the form of natural light, ventilation, rain water harvesting etc. When looking to construct a new warehouse you can rely on Cold Steel’s proficiency and expertise to provide the finest steel warehouses available at a price sensitive to your budgetary constraints.